French fans were treated to their third stage win in this year’s Tour de France, thanks to Pierrick Fedrigo of the Bbox Bouygues Telecom team. The ninth stage from Saint Gaudens to Tarbes was a day largely expected to see a further shake-up amongst the overall contenders, but fortune once again favoured the brave as Fedrigo survived a day-long break to take his team’s second stage win of the race. Fedrigo, along with Liquigas’s Franco Pellizotti, escaped from an early breakaway and commanded a maximum advantage of five minutes over the peloton. Having descended the mighty Col du Tourmalet, the Franco-Italian duo still had some four minutes with forty kilometres remaining. Working by the age-old cycling arithmetic that a peloton can capture a break at around one minute for every ten kilometres, it looked agonisingly close. 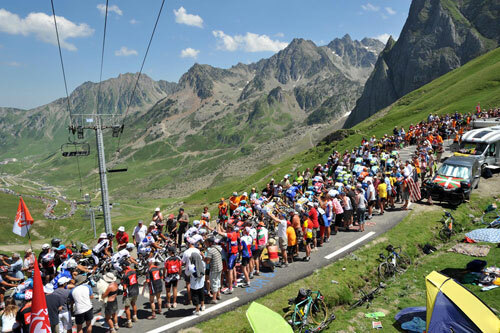 With Mark Cavendish (Columbia-HTC), Tom Boonen (Quick Step) and Thor Hushovd (Cervelo) distanced on the Tourmalet, the impetus to chase fell on the shoulders of Caisse d’Epargne and Rabobank who were visibly fatigued after three days in the Pyrenees. With ten kilometres to go, the peloton had trimmed Fedrigo and Pellizotti’s advantage to just 1-23 and it looked increasingly certain that they would be captured. The earlier ascents of the Col d’Aspin and the Tourmalet had obviously taken their toll on the main field as the break worked well together to fend off the bloodthirsty peloton. Under the flamme rouge, Pellizotti had manoeuvred Fedrigo into leading out the sprint, but the Italian underestimated the Frenchman’s tactical nous. Jumping from Fedrigo’s wheel, Pellizotti gained a few metres but Fedrigo kept his nerve, waited, jumped again and swerved around the Italian for an emphatic win. With the Col d’Aspin and the Tourmalet on the menu today, it was an unpredictable stage to predict but the overall contenders were content to exert a de facto ceasefire over the race. “It was fairly neutral today,” explained Garmin’s Christian Vande Velde after the stage, “it wasn’t worth [attacking] today”. With a long descent from the Tourmalet and a largely flat valley road into Tarbes, it would have taken some daring for any of the contenders to risk attacking. Bradley Wiggins, who has remodelled himself as a Grand Tour rider, echoed Vande Velde’s thoughts after the stage. “It was quite neutral today. I don’t think Lance or Contador want the yellow jersey at this point and Ag2r are happy to defend it. “All in all it was another good day for me. I’ve had a pretty good first week but I’m just going to take it day by day,” explained Wiggins. With two weeks of racing remaining and the Pyrenees not having had the impact over the overall standings that perhaps some were expecting, it looks increasingly likely that the race will be decided in the Alps.